You can organize and structure the existing planning by using summary activities. A summary activity summarizes several related single activities to a superordinated activity. This leads to a clearly structured project plan. To create a summary activity proceed as follows. In the project, on the Start tab, in the Sections group, click Planning. Select the activities and milestones that you want to subordinate and click Group in the Arrange group. For more information on how to create a planning, see Create and edit an activity and Create and edit a milestone. InLoox PM Web App changes the activity above to a summary activity. The activity which is to be changed to a grouping must not contain any links or dependencies. The time period for the grouping is automatically adjusted to take account of items at lower levels. In the Basic information area, in the Name field, type a name for the summary activity. In the Highlight area, select from the Flag drop-down list a flag color to mark the summary activity in the planning. 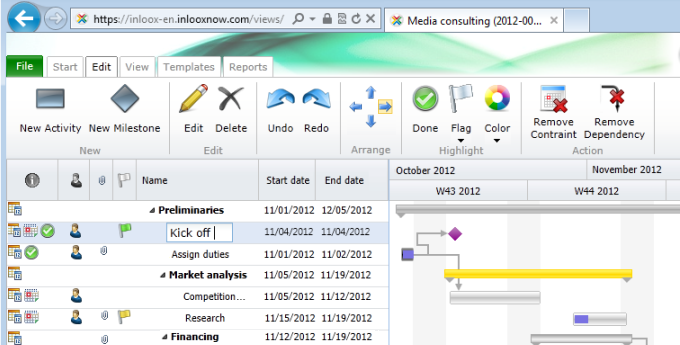 In this area, you can also select the color to mark the summary activity in the Gantt chart by clicking Color . 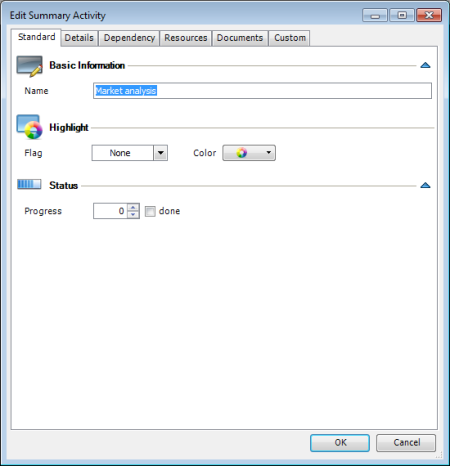 In the Status area, define the progress or select the done check box to display the processing status of the summary activity. In the Description field enter some important information, e.g. the planned deliverables or internal remarks. The information from the Description field will be sent via notification to the divided resources. See Display and process work package for more information about the InLoox notifications. InLoox PM Web App provides you with the range of the formatting features. For the detailed description see Create and change comments in the Customize comments sector. In the Summary activity box select a group or parent, to which the summary activity belongs to define the hierarchy level. In the WBS code filed enter a work breakdown structure code for identifying activities and milestones in large projects. Click in the previously created custom field box and enter a new value for it. For more information on how to add a new custom field in InLoox PM Web App see Create a custom field. Create and edit a summary activity - InLoox • Copyright 1999-2019 © InLoox GmbH. Tutti i diritti riservati.